Now that the 31 Day Challenge is officially over, we're back to our regular scheduled programming! I had to take the night off yesterday to catch up on some much needed sleep, but like the ADHD person that I am, I ended up lollygagging around until I was late for bed. So much for that plan! Hopefully I'll be able to get back on schedule by the weekend. Today's swatch is a polish that I snagged during the last Enchanted Polish restock, called August 2013. Don't ask me how I manage to snag it, I think I must have had a polish fairy sitting on my shoulder as I was refreshing away. 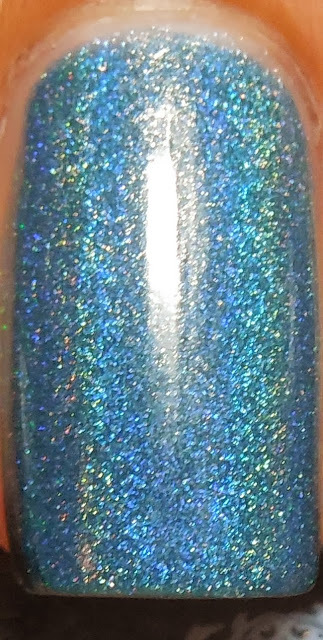 August 2013 is a gorgeous dusty blue leaning teal holo that applied beautifully in two coats. The formula has much improved from the thick formula of the previous month's release, and it's much more fluid and easier to apply. No topcoat in these pics. I really love this shade of teal! I wore this for a few days and it held up beautifully with minimal chipping. After the last month however, I feel like it needs some nail art to spruce it up. I'll have to consider that next time I pull this beauty out. Do you miss the nail art? Uhh this is so beautiful! You're making me jealous! Gorgeous color on you, Thithi! As for adding nail art, we will love you regardless so you do whatever your heart desires! I, for one, have missed your indie posts so I am glad to see you back in that groove! aw, thanks! i've totally missed my regular posts too!! This is a stunning holo! I don't have any Enchanted Polishes, I just know they're really hard to get your hands on. Maybe one day I'll give it a shot! practice your trigger finger!! some of those enchanteds are amazing!